This article is about the "skilled manual worker" meaning of the term. For other uses, see Tradesperson (disambiguation). 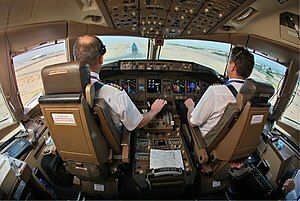 Commercial pilots land a Boeing 777. A rigger at work on the Tennessee Valley Authority's Douglas Dam in Tennessee in the United States, in 1942. 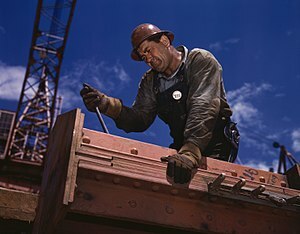 A tradesman, tradeswoman, tradesperson, skilled tradesman, skilled tradeswoman, skilled tradesperson or tradie refers to a worker who specializes in a particular occupation that requires work experience, on-the-job training, and often formal vocational education, but not a bachelor's degree. The terms "skilled worker," "craftsman," "artisan," and "tradesman" were used in senses that overlap. All describe people with specialized training in the skills needed for a particular kind of work. Some of them produced goods that they sold from their own premises (e.g., bootmakers, saddlers, hatmakers, jewelers, glassblowers); others (e.g., typesetters, bookbinders, wheelwrights) were employed to do one part of the production in a business that required a variety of skilled workers. Still others were factory hands who had become experts in some complex part of the process and could command high wages and steady employment. Skilled workers in the building trades (e.g., carpenters, masons, plumbers, painters, plasterers, glaziers) were also referred to by one or another of these terms." One study of Caversham, New Zealand at the turn of the century notes that a skilled trade was considered a trade that required an apprenticeship to entry. Skilled tradesmen worked either in traditional handicraft workshops or newer factories that emerged during the Industrial Revolution. Traditional handicraft roles included, for example: "sail-maker, candle-maker, cooper, jappaner, lapidary and taxidermist, cannister-maker, furrier, cap-maker, dobbin-maker, french-polisher, baker, miller, brewer, confectioner, watch-maker, tinsmith, glazier, maltster, wood-turner, saddler, shipwright, scale-maker, engraver and cutler." from unskilled workers (e.g., laborers) in that the unskilled workers "rely heavily on physical exertion" while those in the skilled trades rely on "specific knowledge, skills, and abilities." Both types of work, however, are considered blue-collar. from professionals in that the professionals have a higher duty of care and routinely make decisions "on the basis of expertise and ability in complex situations where there may be no, or little, previous history." There is no definitive list of modern skilled trades, as definitions vary, with some lists being broader than others. A British study found that, after taking student loan repayments into account, a higher apprenticeship (at level 5 in the national qualifications frameworks) delivered higher lifetime median earnings than a degree from a university outside the Russell Group. Despite this, polling for the report found that apprenticeships have a lower perceived value than bachelor's degrees. ^ Sally Mitchell, Daily Life in Victorian England (Greenwood: 1996), p. 60. ^ a b c Erik Olssen, Building the New World: Work, Politics, and Society in Caversham, 1880s-1920s (Auckland University Press, 1995), pp. 47-49. ^ Whitney, William D., ed.. "Trade." Def, 7. The Century Dictionary: An Encyclopedic Lexicon of the English Language vol. 8. New York. The Century Co. 1895. 6,415. ^ a b Wanda J. Campbell & Robert A. Ramos, "Blue-collar Selection in Private Sector Organizations" in Handbook of Employee Selection (eds. James L. Farr, Nancy T. Tippins: Taylor & Francis 2010), p. 741. ^ Christopher Lawless, Forensic Science: A Sociological Introduction (Routledge, 2016), p. 62. ^ a b Employment and Occupations in the Skilled Trades in Michigan, Michigan Department of Technology, Management, and Budget, Bureau of Labor Market Information and Strategic Initiatives (June 2013). ^ "Levels of Success". Sutton Trust. 9 October 2015. Retrieved 14 February 2016. ^ "Occupational Outlook Handbook". Bureau of Labor Statistics. Department of Labor. December 17, 2015. Retrieved September 29, 2017. The OOH can help you find career information on duties, education and training, pay, and outlook for hundreds of occupations. ^ Torpey, Elka (January 2019). "High-wage occupations by typical entry-level education, 2017". Bureau of Labor Statistics. Department of Labor. Retrieved February 9, 2019. Overall, wages are higher in occupations typically requiring a degree for entry than in occupations typically requiring less education. But that’s not always the case. ^ "Three Educational Pathways to Good Jobs". Center on Education and the Workforce. Georgetown University. Retrieved October 16, 2018. There are 13 million good jobs for workers with a high school diploma, 16 million good jobs for workers with middle-skills preparation, and 36 million good jobs for workers with bachelor's degrees (BAs). Look up tradesman in Wiktionary, the free dictionary.